With the ever increasing deductibles, premiums, and out of pocket maximums that dominate this era of insurance coverage, the Internal Revenue Service has graciously allowed the use of various employer and employee sponsored programs to help employers and employees mitigate the increasing cost of insurance while allowing tax savings on certain elections to those programs. Here we will outline the various accounts used, how they work, and in what scenario they are best used in. 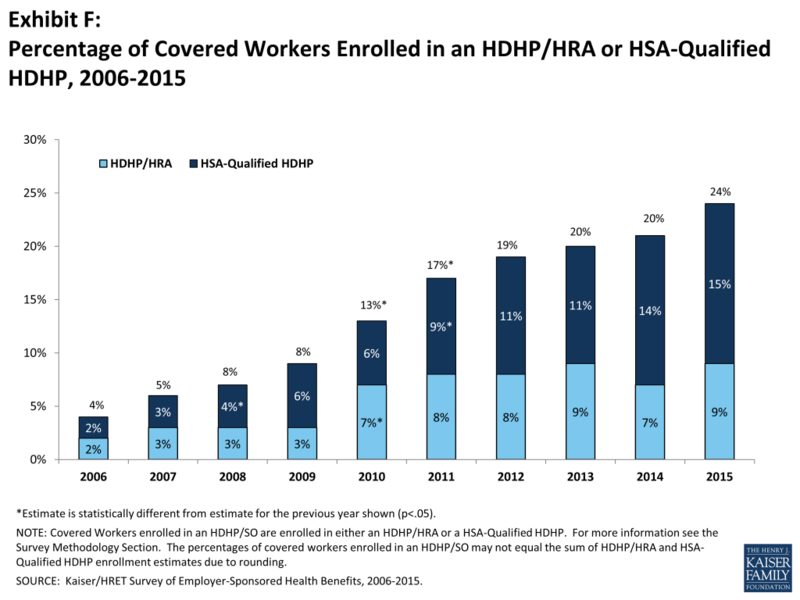 The rationale behind an employer funded HRA is this: most HDHP are lower in monthly premium than lower deductible plans. Therefore, the employer can save quite a bit of money in lowered premium costs for their employees, especially if that employer pays a percentage of the employees premium costs. The projected savings in premium costs verses other plans can be put into an HRA to help fund, either partially or totally, the employees deductible. Here, the employer will retain any HRA money that isn’t used by the employee during the plan year. With HRA utilization, or the total amount of the original used during the plan year, is typically around 60%. That means and employer funding an HRA can expect around 40% of the total to be returned to the employer, or rolled into the next plan years funding. A way to cut down on HRA utilization is having the employee fund a small part of the deductible up front before the employer money is used. One third party administrator found that when employees had to pay first on their deductible before employer HRA money was used, it cut down on HRA utilization by over 17%. Wellness programs are also a good way to cut down on HRA utilization as healthy employees tend to not use as many medical services as unhealthy workers do. Overall, HRAs are a great way to help employers save on premium dollars right away, and potentially be returned the extra money set aside for the employees deductibles. It’s a win-win in many cases and we have implemented hundreds of these plans for our employers. Flexible Spending Accounts, or FSA’s, are another way of helping employees meet the cost of their health needs. FSA’s are primarily funded by employees on a pre-tax basis, with the 2017 IRS limit being $2600 annually. FSA contributions can be made by the employer as well, however generally speaking, what an employer does for one employee, the must do for all eligible employees, unless those eligible employees are split up by classes (i.e. management and non-management) or collective bargaining agreements. While an employer does not save any tax money on contributions to an employee’s FSA, the employees contributions are usually made on a pre-tax basis, or from the top-line or gross income, before taxes are taken out. This means that the employer does realize some taxes on the employee contributions; namely the employer saves on the matching FICA (Social security and Medicare) taxes as well as the matching FUTA (Federal Unemployment Tax) due to the lowered top-line income of the employee. Putting money into an FSA can lower your overall tax liability to the IRS, and effectively can increase your net take home pay if the same costs are incurred verses not having an FSA. 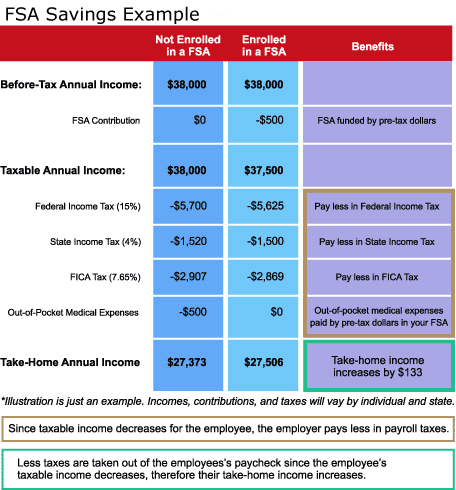 Pictured in the example, if an employee makes $38,000 annually and has $500 in medical expenses, their effective take home pay is $133 more if they had put the $500 into an FSA rather than paying with after tax dollars. Per IRS guidelines, annual elections to an FSA are to be made available to the employee from day one of the plan year, which means that even though the payroll deductions haven’t been taken yet, the annual amount is available to the employee once the plan goes into effect. This means there is risk to the employer if the employee leaves the company before all the deductions have been made. There is also risk on the employee side, because any amount over $500 that the employee doesn’t use by the end of the plan year gets returned to the employer. Dependent Care FSA’s are Flexible Spending Accounts that cover qualified expenses associated with taking care of a child, such as day care, or in some cases elderly care. The maximum amount per year in 2017 is $5000.